Cutting end of scissors are wrapped in red cloth, red being a sacred color of the Native people and tied with sinew, the tendons of the animal nations who give their lives for the survival of the people. The cutting end is covered as a reminder not to cut into the hearts, souls and spirits of others by our disrespectful actions and words. The feather represents the Native peoples in our churches and communities across our nation. The handle end of scissors has a red bundle tied to them. This bundle is filled with tobacco representing a prayer said for peace and healing. 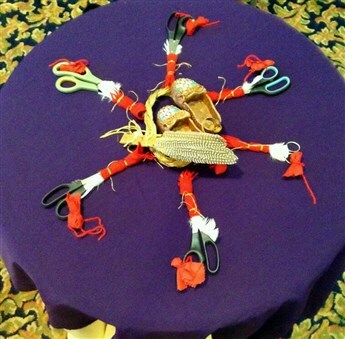 Each prayer bundle was made by Native and non Native peoples as they walk this journey of healing. The Committee On Native American Ministries shared the story "Braids", told by well known Cherokee story teller. "Braids" is a story of the historical traumatizing event of a Native child's experience of being placed in an Indian boarding school and the effects this experience had on his daughter and his grandchildren. This daughter spends most of her life trying to figure out why her father didn't love her. The feeling she got with her father's inability to show emotion. As this adult daughter was braiding her hair one day, her father's image appeared in the mirror and it took her back to a time when she was a child and her father braided her hair. She also recalled the time her Auntie shared the story about her father being in a boarding school for Indian children operated by the Church. With the realization of how traumatic this experience must have been on her father, she begins to understand that her father could not give to her what he, himself, did not receive. That perhaps the time her father braided her hair was the only way for him to share the love he had for her. Reflecting upon her own life, she could see how she, herself, was living in historical grief and passing grief on to her own children. With this new found awareness she was able to better understand and find ways to break this cycle of life before it destroyed future generations. "Braids" is a powerful story that brings into awareness how the first indigenous peoples of this land were traumatized in the boarding schools operated by our government and the Church. It calls us, the Church, to recognize it's part in this historical trauma, repent, and begin the process of healing for all of us.